We’d love your help. Let us know what’s wrong with this preview of What We See In The Smoke by Ben Berman Ghan. The world we know is coming to an end. How will we connect in the strange and frightening one that’s coming to take its place? 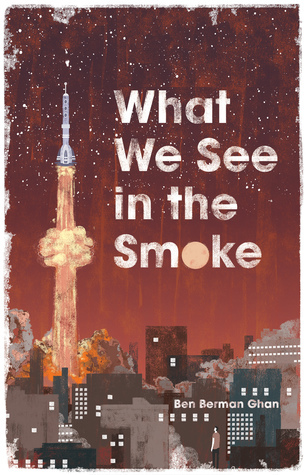 What We See in the Smoke twists the genres of realism and science fiction to tell the future history of Toronto, a story that stretches from this millennium to the next. The novel leaps across the boundaries of time and space, as present and future The world we know is coming to an end. How will we connect in the strange and frightening one that’s coming to take its place? What We See in the Smoke twists the genres of realism and science fiction to tell the future history of Toronto, a story that stretches from this millennium to the next. The novel leaps across the boundaries of time and space, as present and future Torontonians search for meaning, connection, and love in a city that grows more beautiful and frightening as its familiar characteristics fade away. A musician is caught in an endless time loop unable to reach those he loves, two broke and desperate men plan a heist of a cannibal auction, a detective with sinister proclivities hunts for a criminal who is stealing dreams, and a college student searches for his brother in the hours before a nuclear war. All of these and more lead to a world where only rich cyborgs or the homeless remain, where teleportation has made crime impossible, and where city-sized spaceships are maintained by strange creatures while planet Earth itself is left behind. To ask other readers questions about What We See In The Smoke, please sign up. Ben Berman Ghan is an author and editor from Toronto, finishing an HBA with a major in English Literature, Philosophy, and Writing and Rhetoric at The University of Toronto, and moving to a MA in English at Ryerson University’s Literatures of Modernity program. His fiction, poetry, and essays (but mostly fiction) have appeared in The Goose, The UC Review, Indigo Lit, Occulum Journal, Kaaterskill Ba Ben Berman Ghan is an author and editor from Toronto, finishing an HBA with a major in English Literature, Philosophy, and Writing and Rhetoric at The University of Toronto, and moving to a MA in English at Ryerson University’s Literatures of Modernity program. His fiction, poetry, and essays (but mostly fiction) have appeared in The Goose, The UC Review, Indigo Lit, Occulum Journal, Kaaterskill Basin Literary Journal, South 85, Liquid Imagination, The Sweet Tree Review, The Spectatorial, The Trinity Review, Terse Literary Journal, The Strand, Intersections, and The White Wall Review. He has served as the Fiction Editor of The Spectatorial, and Associate Editor for The Goose. He is currently the editor of a book of non-fiction for Guernica Editions, Prose editor of Terse Journal, and Associate editor on The Hart House Review. His writing occurs in the place where the ideas of classic science fiction meet the interpersonal concerns of all literature.